In the main hall, wood floors are marbleized, the block print paper pattern dates to 1776, and the ca. 1880 Wilton stair carpet is a reproduction. The patterns and colors may be unfamiliar to modern tastes, yet the harmony of design in this New England house is clear. Walls, ceilings, floors, and furnishings support and accentuate each other. The owner selected materials accurate for the period—and consistent not only in palette, but also in scale and pattern. By building a vocabulary in the spirit of Georgian and Federal styles, she created authenticity with carpeting, wallpaper, and paint colors. That’s the lesson for those who seek to re-create a credible “historic interior”: Whether your period is 1670 or 1940, holding to a standard will get you there. This residence is prominently located in a large district of 18th- and early 19th-century brick buildings in an old seacoast town at the Massachusetts/New Hampshire border. Built in 1777, it served as a family home for a century and a half, but was eventually acquired by a local church parish, which used it as a religious school for decades. As is often the case, church administrators were concerned with issues other than historical sensitivity. Central walls on the first floor were ripped out to create large classrooms, in which iron desks were bolted to original floorboards. The students long ago departed, and by 2002 the neglected manse lay abandoned, awaiting wrecking ball or savior. The house found a savior. 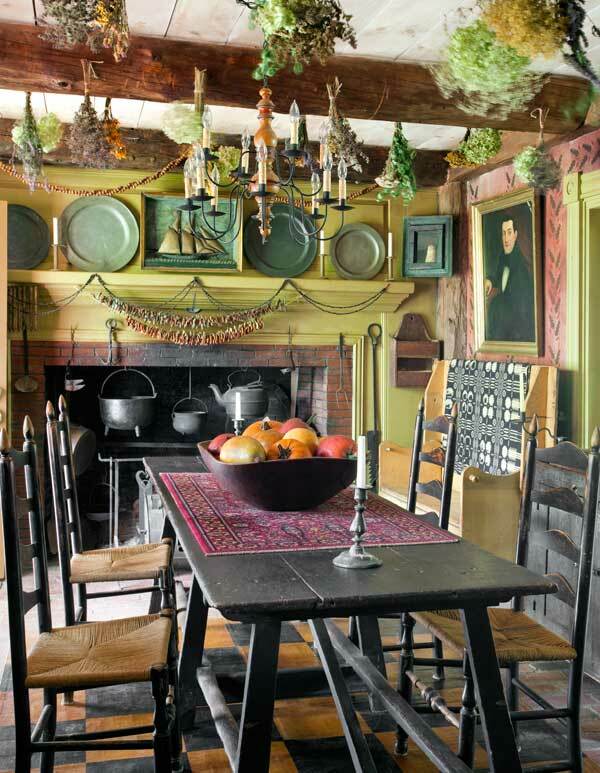 The brave new owner, a committed former resident of a Federal house, took it upon herself to restore the structure not just for her own family’s tenure, but also with the past and future in mind. Some of her decisions were clearly informed by her passion for historic preservation. Interior restoration started with a scrap of wallpaper. The pattern, now known in its reissue as ‘Votive Goddess,’ was painstakingly reproduced as a block print. In an unusual treatment, it had been hung originally in both the best and everyday parlors, accompanied by a different color for the woodwork in each room. This presented an interesting challenge during selection of a Brussels carpet that would be used for both parlors. 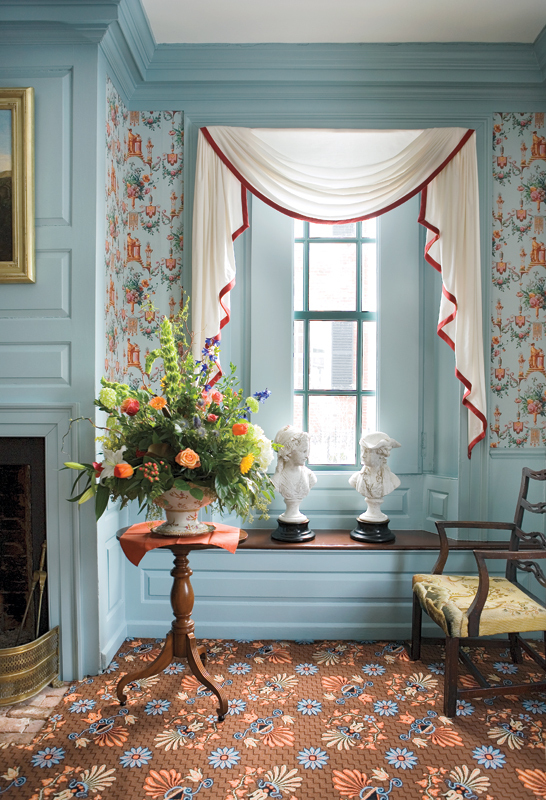 The decision: Use the same pattern and colorway for carpeting in both rooms, but add a border in the best parlor—truly a luxury in the 18th century. The old kitchen has an original cupboard painted in period colors. 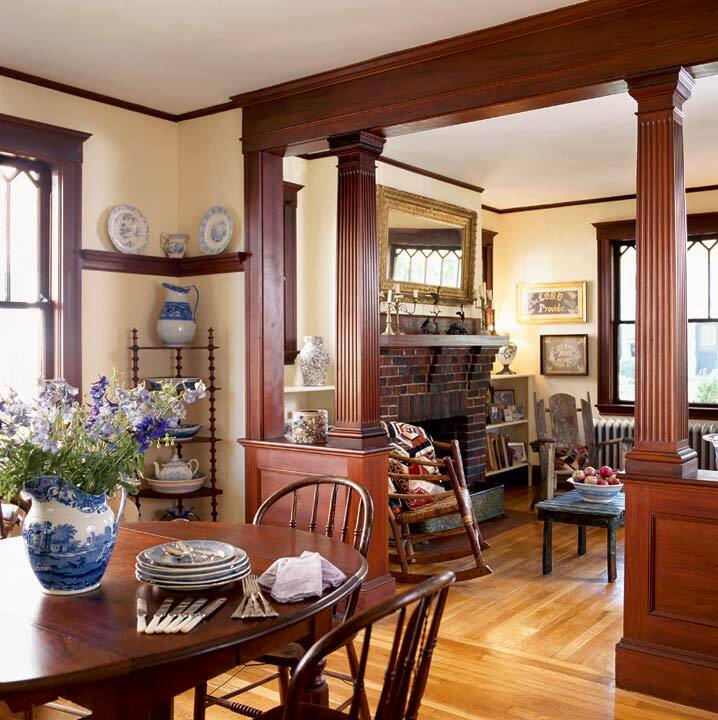 The owner’s passion for period-appropriate lighting led her throughout the Northeast. She also commissioned some meticulous reproductions, most notably the sprawling chandelier in the best parlor and the lanterns in the hall. These are strategically placed with a drop to 5&apos;8" from the floor. The owner indulged her decades-long fascination with girandoles and mirrors, which are displayed throughout the house. 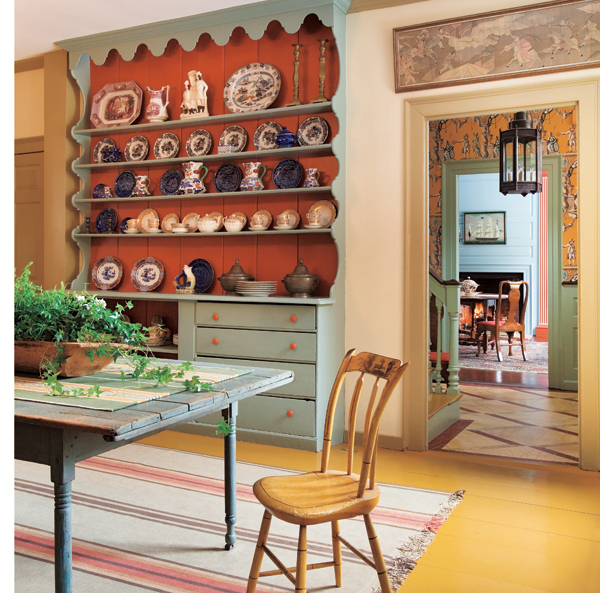 A longtime collector of (Boston) North Shore antiques, she was able to furnish the rooms as soon as construction ended, as her spoils were safely in storage. 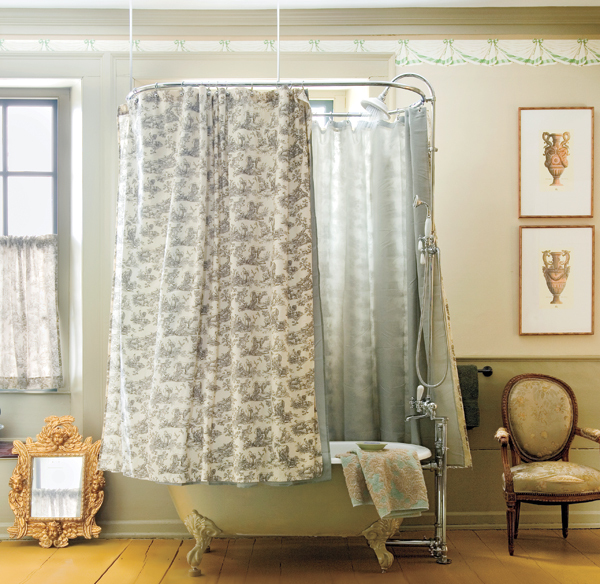 Bathrooms are a challenge for those of us who re-create the past in hopes of stepping back in time—especially if that time is the 18th century. Chamber pots and washbowls are rustic and quaint on display, but never so in practice. So one of the spare bedrooms was converted into a luxurious bathroom decorated with historical textiles and wallpaper, making it a “toilette” and dressing room. While the illusion of history is present, so, too, is hot and cold running water. A modern HVAC system is concealed within the eaves on the third floor, behind original hand-skived boards. 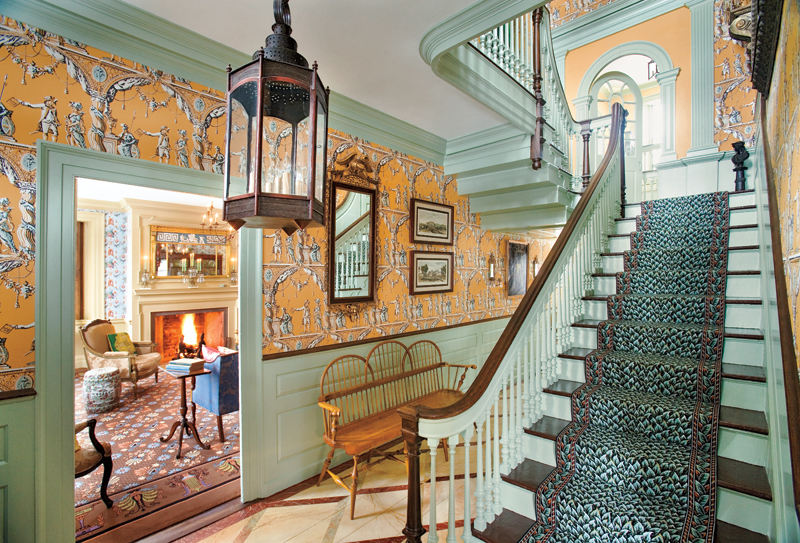 Both the best and everyday parlors were hung—originally and again now—with the same wallpaper, but with different paint colors on trim. The exterior of the building was treated to a substantial restoration as well; three missing chimneys were replaced, along with the dormers and front portico. It was easy finding bricks to match the one remaining chimney: They had been dropped down the flues to rest in the basement. Because of the dwelling’s prominence, several archival photographs from the 19th and early 20th centuries existed to guide reconstruction of the façade. Save for one window bricked up during an early 19th-century modification of the dining room, the house today looks just like it did in 1777. Although the owner took a scholarly approach, and the house is firmly rooted in the Georgian and Federal periods, it doesn’t feel like a museum. Rooms are comfortable, vibrant, and alive. As historical as the interior is, the house gives no impression of having been shuttered up at some point in the dim past. Period carpets: J.R. Burrows & Co.